Beaches Negril’s Hilroy Mighty has certainly mastered the art of multi-tasking. He manages to focus on reservations and accept telephone calls while still sporting a smile. He has given of himself to the industry for well over 20 years and still Hilroy Mighty’s passion to please, excite and spread love and care to customers remains unwavering. The fact that the 50-year-old Concierge Supervisor at Beaches Negril often receives rave reviews from visitors is proof of this. So loved is he by his guests that one in particular asked him to be a witness at his wedding. “The concierge team, who we met on arrival – you are great! Hilroy went out of his way to assist us with upgrading to a different room category. He was amazing and checked in on us throughout the stay. We were so touched by Hilroy that my husband asked him to be a witness at our wedding. Hilroy came in on his day off to perform this for us and is now considered to be part of our family, or as he said, ‘our Jamaican brother’. My husband actually shed a tear when he bid Hilroy farewell,” shared the guest on Trip Advisor. When Hilroy Mighty listens to the thankful words from his guests, employers and colleagues, his reaction is always a humble nod accompanied by a smiling, “You are welcome.” But, if you continue the conversation beyond the appreciative mutterings, you might just get the reason behind why this man has been so inspired to blaze his own trail, wowing and satisfying visitors of all ages and from all walks of life. “I am the one who is thankful to the tourism industry that has given me so much. My biggest achievement to date is being able to provide my children with a comfortable life and a very good education, all thanks to my years working in hotels,” Mighty shared. Mighty started working for the Beaches brand after Beaches Sandy Bay took over Poinciana and then later transferred to Beaches Negril. 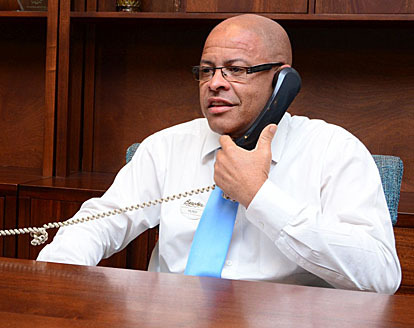 He has served as a bellman, doorman, lobby host, front desk agent, relief night auditor, concierge agent and, since May 2018, concierge supervisor. As the supervisor for the concierge department, Mighty is always on the floor, ensuring that all standard operating procedures are followed and that his 17 team members complete their tasks effectively, make the guests happy and are motivated to come to work. Mighty revealed that at times he is surprised at how much of an impact he has made on a guest. He said, “Sometimes when I read the reviews from a family, I stop and wonder if they are really talking about me,” he expressed. They are indeed talking about Hilroy, and many more glowing reviews will come as Mighty continues to impress his guests and lead a great charge for his team to follow.